I replaced dozens of vulnerable components using modern but original-looking ones and whilst there can never be guarantees that other things in it won’t fail, I hope it will still be going strong in another 40 years’ time. It took me a very long while, (thank you Rich for your patience) but was something of a labour of love. 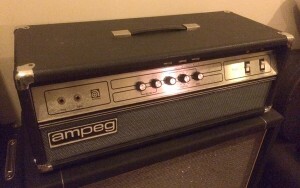 I have always loved Ampeg Bass amps – the B15 from the 60s is still used in many studios and was the amp used by the legendary Mowtown bassist James Jameson.